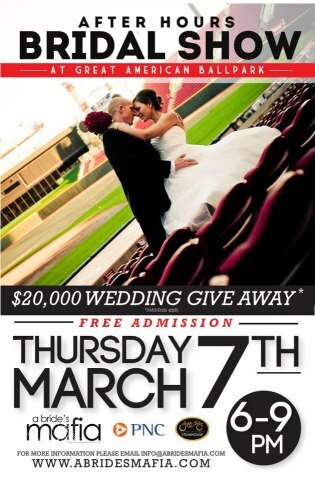 On March 7th Great American Ballpark will play home to A Bride’s Mafia Afterhours Bridal show and “The Grooms Gameplan”. The Bridal Show will feature a wedding giveaway worth $20,000! you’ll get to meet the top wedding experts in Cincinnati and view the amazing facilities available at Great American Ballpark for weddings and receptions. “The Grooms Gameplan” Is a workshop to be held during the show, overlooking the field in a private area of Great American Ballpark. You’ll here from me, Brandon Lindsey as I present ideas that grooms can incorporate into your day and into the planning to make you look like an all-star and to make your bride feel really special. You’ll also hear from a few other experts with tips on Travel, Tuxedos, Venue Selection, Photography and more. This workshop is for grooms only. To RSVP text 513-617-5817 with your name and the word GABP. See you at the show. Oh and Admission is FREE! Check out A Brides Mafia for more details.